Rob Kiser|Call Photo Edison State hitter Rayna Brownlee squares the bat up on the ball against Henry Ford Sunday. Edison State’s Hannah Oaks slides across the plate with a run Sunday as Henry Ford catcher Jaclyn Clark tries to grab the ball. Rob Kiser|Call Photo Edison State pitcher Lexi Romine fires a strike against Henry Ford Sunday at Piqua High School. The Edison State Community College baseball and softball teams have been busy. Earlier last week, they split a doubleheader to Owens Community College. ESCC won the first game 10-8. Edward Alexander was 3-for-4 with three RBIs, while Jacob Clements was 2-for-3 with three RBIs. Layne Riley was 2-for-4 with a double and one RBI and Travis Smith had a double and one RBI. Tyler Defibaugh, Ben Thomas and Reese Rogers combined on a 10-hitter, walking five. Edison State lost the second game 4-3. Leamsi Bermudez had two hits and Mason Mochabee had a double. Cooper Denney and Dylan Welch combined on a four-hitter, striking out eight and walking seven. On Saturday, the Chargers won 13-3 and lost 2-1. In the first game, Layne Riley was 3-for-4 with a double and three RBIs, while Leamsi Bermudez was 2-for-4 with a triple. Edward Alexander was 2-for-3 with five RBIs, while Chase Schoeff and Montana Allgaier were both 2-for-4. Travis Smith had a triple and two RBIs and Dylan Arnold doubled. James Gainion and Dylan Welch combined on a five-hitter, striking out two and walking four. In the second game, Riley and Alexander were both 2-for-3. Wyatt Meyer and Reese Rogers combined on an eight-hitter, striking out two and walking eight. On Sunday, ESCC lost 4-2 and won 5-2. In the opener Alexander was 2-for-4 and Smith doubled. Kolby Wooten and Cooper Denney combined on a three-hitter, striking out seven and walking nine. In the second game, Mason Mochabee was 2-for-4 with two doubles and Ben Thomas had two RBIs. Jacob Clements added a triple. Riley pitched a complete game four-hitter, striking out 12 and walking four. The Charger softball team had a challenging weekend, but finished it off with a “bang”, literally. Playing a doubleheader with Henry Ford, Edison bounced back from an 8-6 loss the first game with a 12-3 win in the second game. After Tori Smith put down a perfect suicide squeeze, Adrianna Hicks blasted a three-run walk-off homer to end it. Hicks was 2-for-4, also had a triple and had four RBIs, while Maddie White was 3-for-4 with two doubles and three RBIs. Tori Smith had two RBIs with a double and Lexi Romine was 3-for-4. Wendy Hawk was 2-for-2, Mackenzie Smith was 2-for-3 and Rayna Brownlee had a double. Smith combined with Hallie Snyder on a seven-hitter, striking out two and walking one. In the opening game, Edison fell behind 7-1 and couldn’t quite rally back. In the home seventh, Romine — who was the pitcher — had a double to score Hannah Oaks to make it 8-6, with the tying runs on second and third. But, Henry Ford got the final out to hold on. Hawk was 2-for-3 with a double, Romine was 2-for-4 and Mackenzie Smith homered. Tori Smith added two doubles. On Saturday, Edison lost two games with Mercyhurst North East. The Chargers lost the first game 2-0. Hawk had a double for the Chargers. Romine and Snyder combined on a five-hitter, striking out four and walking three. 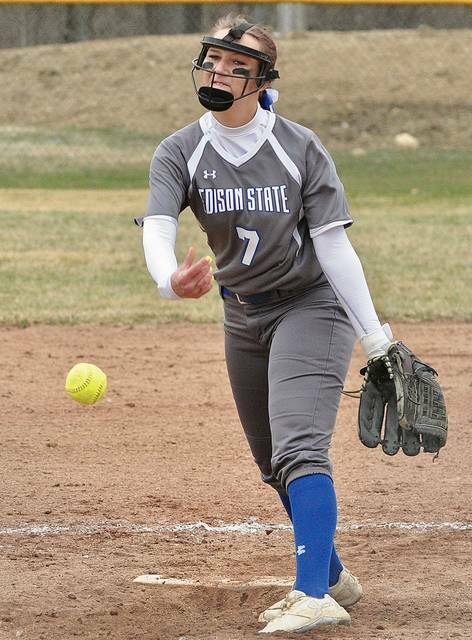 Snyder pitched a perfect seventh inning, striking out all three batters she faced. The Chargers lost the second 15-12. Lexie Long was 4-for-5 with two doubles, while Romine was 2-for-3 with two RBIs and Hawk was 2-for-3 with a home run and three RBIs. Tori Smith was 2-for-4 with a double and two RBIs and Mackenzie Smith was 2-for-5 with a double. Hicks was 2-for-4 with two doubles and two RBIs. The Chargers are now 6-6 on the season. 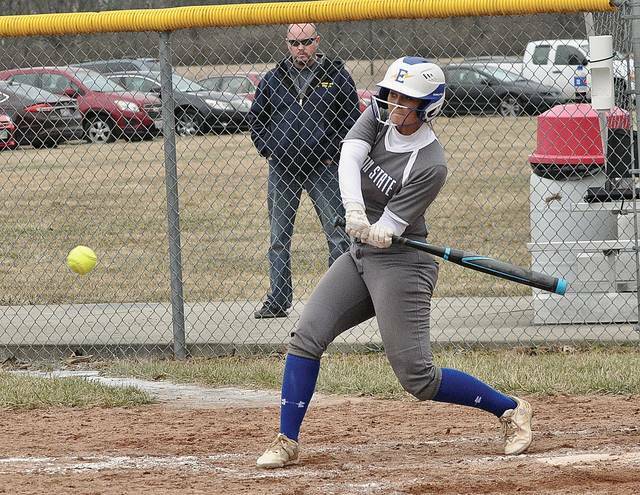 https://www.dailycall.com/wp-content/uploads/sites/30/2019/03/web1_rayna-1-.jpgRob Kiser|Call Photo Edison State hitter Rayna Brownlee squares the bat up on the ball against Henry Ford Sunday. 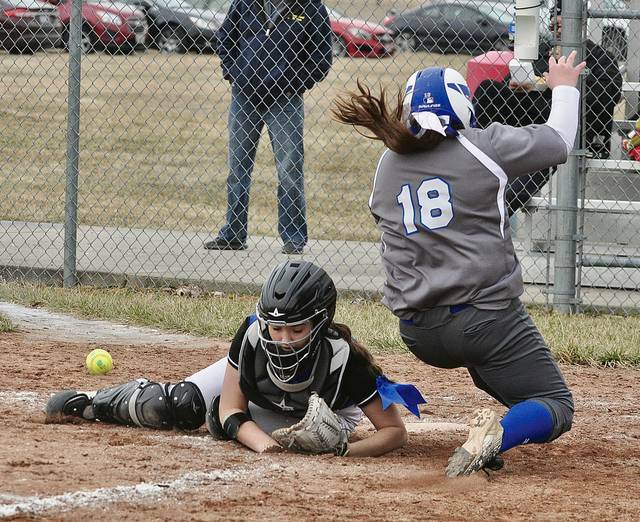 https://www.dailycall.com/wp-content/uploads/sites/30/2019/03/web1_hannah.jpgEdison State’s Hannah Oaks slides across the plate with a run Sunday as Henry Ford catcher Jaclyn Clark tries to grab the ball. https://www.dailycall.com/wp-content/uploads/sites/30/2019/03/web1_lexi-1-.jpgRob Kiser|Call Photo Edison State pitcher Lexi Romine fires a strike against Henry Ford Sunday at Piqua High School.